The reason that we emphasize flossing so much at our dental office is that this simple activity can make a huge difference when it comes to your oral health. When you brush your teeth, your toothbrush is able to clear away plaque and other particles from the top of each tooth, as well as the front and back. However, the two other sides - which are called interproximal surfaces - are up against other teeth, making it hard for the bristles of your brush to reach them. That means that if you aren’t flossing, you’re missing up to 40 percent of each tooth! Many of the cavities that we see in the office are in these areas because patients aren’t flossing regularly. Flossing also helps keep your gums healthy. Bacteria can collect between your teeth causing gingivitis, a gum disease that creates painful inflammation and can lead to bone loss if not treated. Without regular flossing and cleanings at a dental office, hardened plaque can build up, causing more serious problems that will have to be treated by a dentist. Luckily, gingivitis is fairly easy to avoid. If you notice the early signs of the disease - sensitivity, when brushing or flossing, and inflammation - come in to the office for a cleaning and be diligent about flossing regularly at home. In addition to improving the health of your teeth and gums, flossing can also improve your breath. Oftentimes bad breath can be the result of bacteria and food trapped between your teeth. A little flossing will make a big difference! Proper floss placement. Make that "C" shape! Wrap the floss around your middle or ring ringer on both hands. Insert the floss between two teeth and rock it gently between each tooth. Make a “C” shape and hug each side of the tooth (each place where the teeth come together will require two “ins and outs” of the floss). Go up and down on the back tooth, up and down on the front tooth. See the photo for an example! 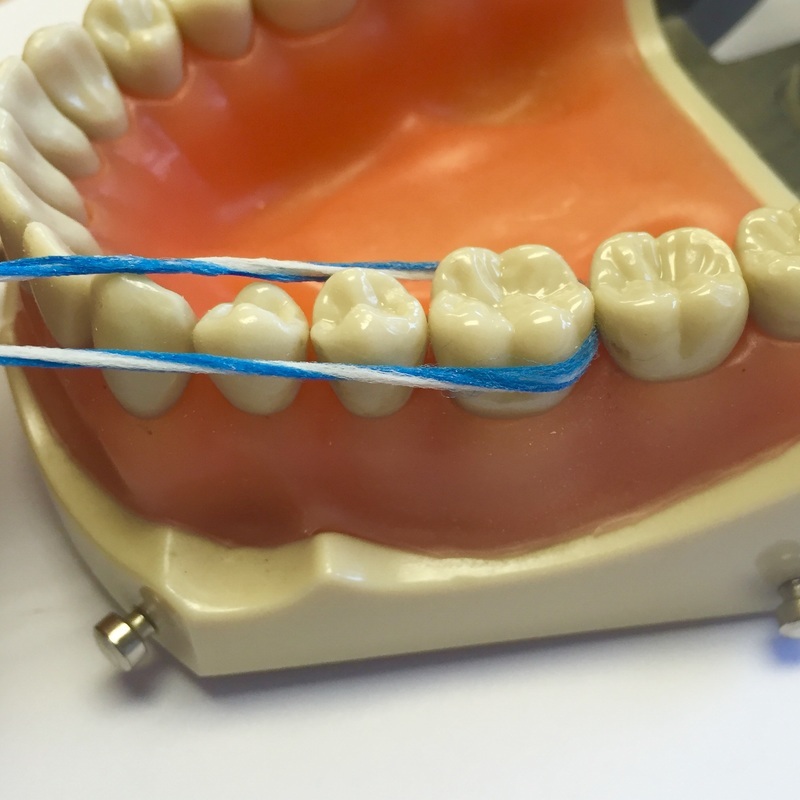 Be sure to be gentle as you flossing, as ramming the thread into your gums can leave them sensitive for several hours. And don’t forget to floss behind your back molars! Even though there isn’t another tooth there, plaque can still build up on the back side and cause discomfort. 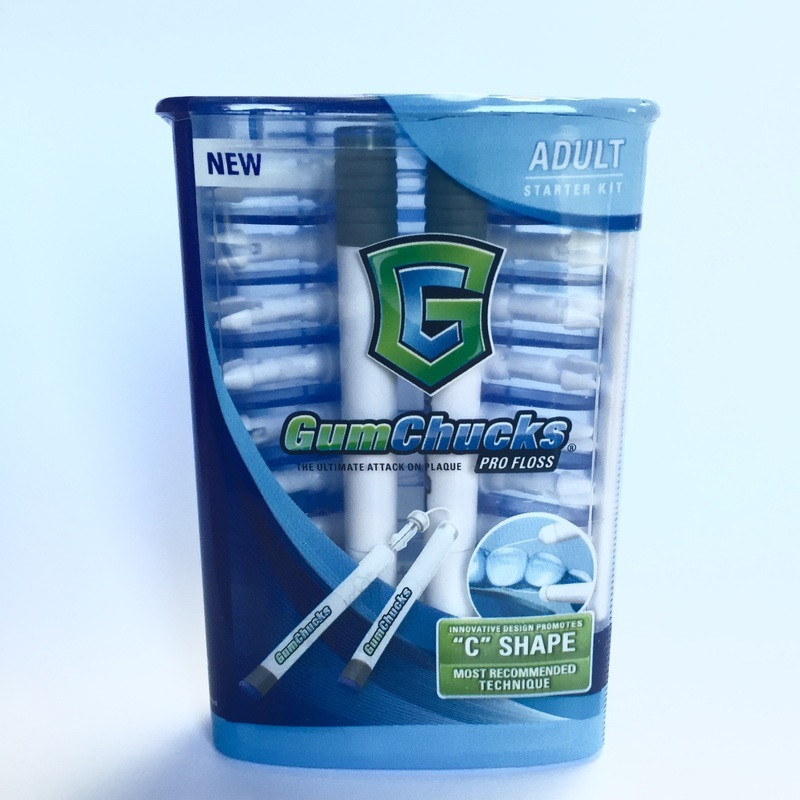 If you don’t like flossing, or have a child who may have a hard time with it, consider using GumChucks, an easier alternative to the traditional method. Want to learn more? Check out this video. GumChucks are available for purchase at our office! Plastic: This type is thinner, which makes it ideal for tight teeth. Cotton: The small threads of cotton floss pick up bacteria that plastic options may miss. Wax: In between the plastic and cotton options, wax can be a good place to start so you can get an idea of which type you prefer. Flossers: These Y-shaped plastic tools with floss between the arms are convenient for getting those hard to reach back teeth. But they can’t make the c-shape that you need to ensure you get every surface. GumChucks: Similar to flossers, the arms of GumChucks are movable, which allows you to make the c-shape that will make your flossing most effective. Any of these types are good options for your flossing. The most important thing is to choose an option that you’ll use daily, so go with whichever one is most comfortable for you. This is probably the most common question we get at the office, and the answer is simple: daily! However, it doesn’t hurt to brush more frequently, especially if you’re prone to cavities or have experienced gum sensitivity in the past, in which case you may want to consider flossing after every meal.